I am headed to Long Island this week and my first stop (after I say hello to my parents) is the nearest farm stand. My father’s vegetable garden is wonderful and bursting with all sorts of goodies, but there’s no corn to be found. And I can’t be on Long Island in the summer without corn. I think my father doesn’t plant it because A) corn takes up too much space and B) when he was growing up on a farm in Italy, corn was fed to the pigs, not to human beings. He just doesn’t get it. But you get it, don’t you? Americans love their corn. Raw, sautéed, grilled, boiled, in muffins and flapjacks, whatever, love it all. And I am not above gnawing on the cobs if no one else wants them. 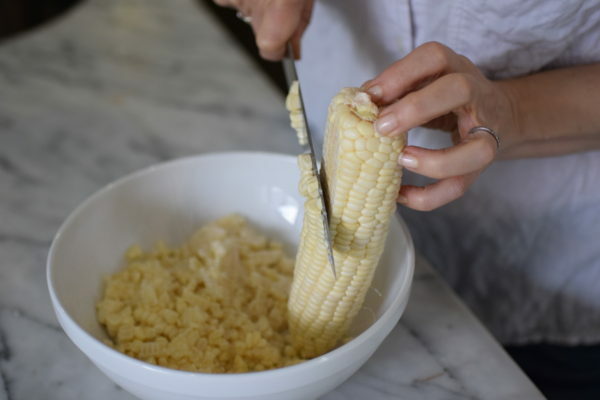 I usually make something with corn once or twice a week in the summer. How about you? This chowder (that’s really not a chowder, but a soup) is my obsession. This soup is not technically a real chowder because it doesn’t contain cream. Or milk either for that matter. 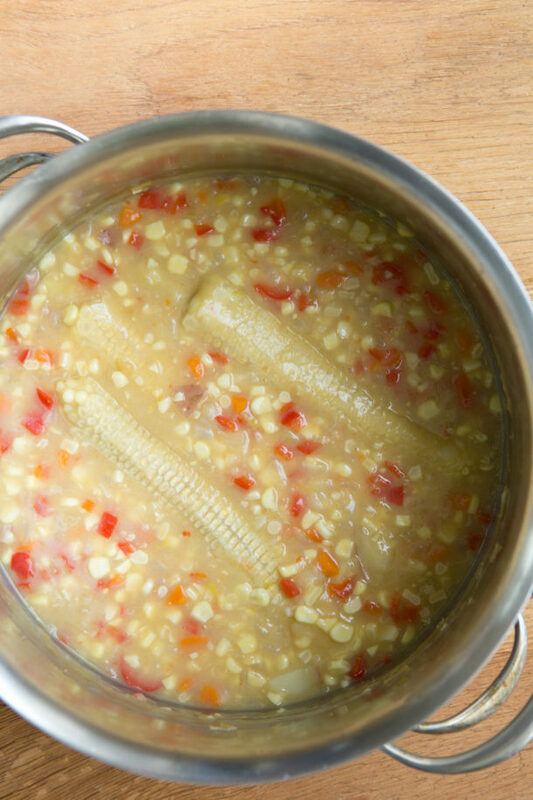 This corn soup gets it richness from potatoes pureed in a corn stock. Corn stock? Yes, my friends. Look at those cobs in the pot. Did you know they have tons of flavor?? It’s like a summer’s farmers market in there — fresh, sweet, chunky, and silky. So many great flavors and lots of fiber and antioxidants. I tend to eat a little lighter in the summer and I would easily consume a huge bowl of this and call it a meal. My kids don’t always accept the concept of one thing for dinner, so I might need to put out some raw veggies and hummus for them with this soup. But everyone in my house and my classes gave this a big thumbs up. One of my students has a few kids who aren’t super open-minded about lots of visible vegetables in their bowls, so she pureed the entire soup and she said her kids were licking the bowls clean. Is she my hero, or what? So genius! If you’ve hung out with me before, you know that game I like to play where I imagine all the fun tweaks you can make to a recipe? That’s really fun with this soup. Like I mentioned, you can puree the whole thing. You can also start the soup by crisping up some (nitrate-free) turkey bacon which will add great flavor. You can top this soup with many different herbs from basil to cilantro to chives. It would also be great with cooked shrimp or crab on top. 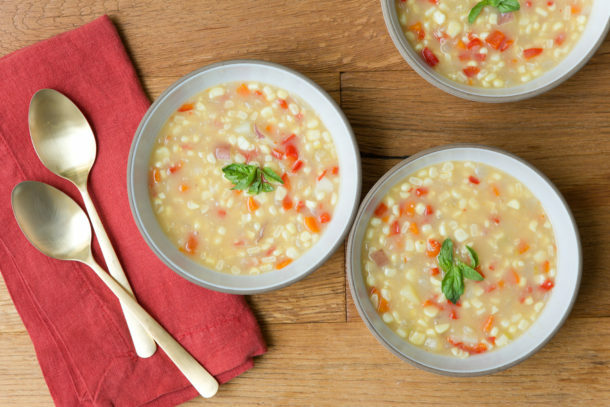 Just don’t throw away those cobs once you’ve eaten the soup — they make for a tasty little snack! 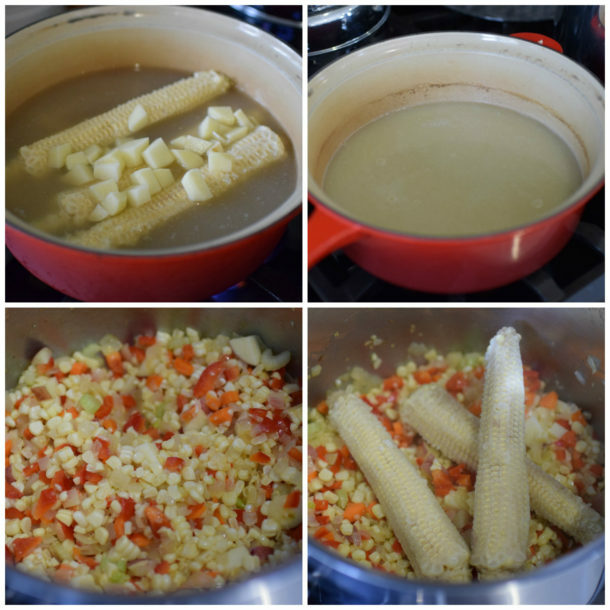 In a medium saucepan over high heat, combine the corn cobs (halved if they fit in the pot better), 2 cups diced potatoes, and stock and bring to a boil. Reduce the heat to low and simmer for 20 minutes, or until the potatoes smash easily with a fork when pressed against the side of the pot. Remove the corncobs and place in the pot you'll use to saute the vegetables in Step 3, even if you've already started that step. Puree potato-stock mixture until smooth (use an immersion blender or standard blender.) Reserve. Add reserved stock to the vegetables. Raise the heat and bring to a boil. Reduce the heat to low and simmer for 2 more minutes. Season with salt and pepper to taste, and serve with chopped basil if desired. 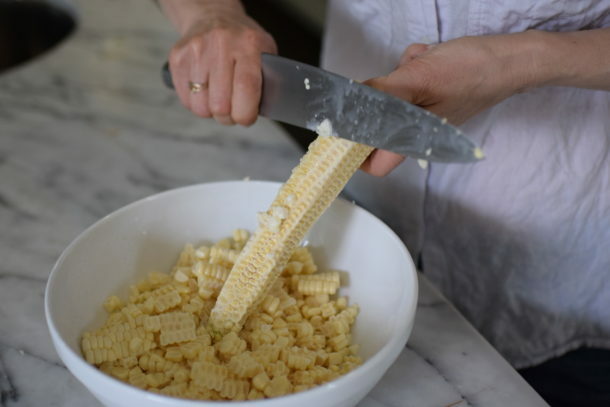 Can organic frozen corn be used? I cannot find organic fresh and I am afraid to buy GMO corn. You can, but it’s not quite as good. It’s fine, don’t get me wrong. It’s just not as outstanding as with fresh. 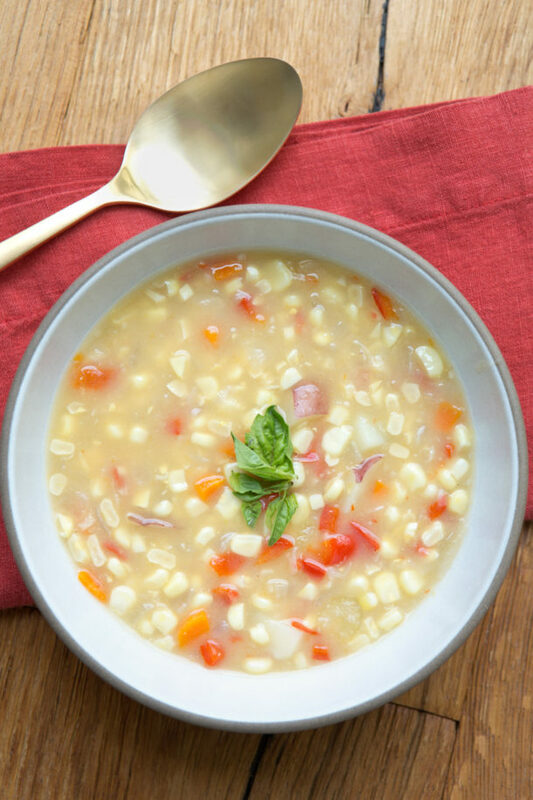 We are fans of corn chowder to begin with and I made this a couple of weeks ago and it was delish! 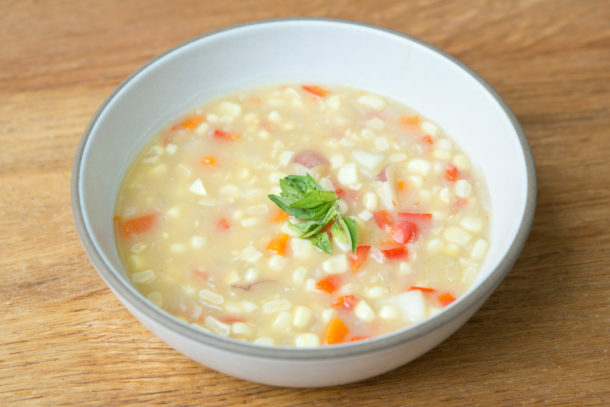 It was nice to have corn chowder in the summer. We usually only have it in the winter. I have this new appreciation for summer corn. 🙂 Thank you! Loved this soup! Super easy to make. I was s little nervous because it seemed a little watery at first, but after letting it sit for a little bit, it thickened up. My Au pair, who is from Colombia, ate 2 bowls – said it is a popular dish back home! Would Yukon gold work well? Can’t wait to try! I made this very soup last night! The Olathe sweet corn in Colorado is wonderful right now! The red bell pepper, to my taste, is a perfect compliment to corn!